This was a hike that I was looking forward to for some time. I was ready to tackle the Huntington Ravine Trail, which is considered the toughest regular hiking trail in the White Mountains, just a step or two below requiring technical climbing gear. I wasn't expecting any real problems, though. Steep exposed rock doesn't really bother me, and I even brought my rock climbing shoes with me, intending to change into them when I got to the steep slabs where handholds were required. 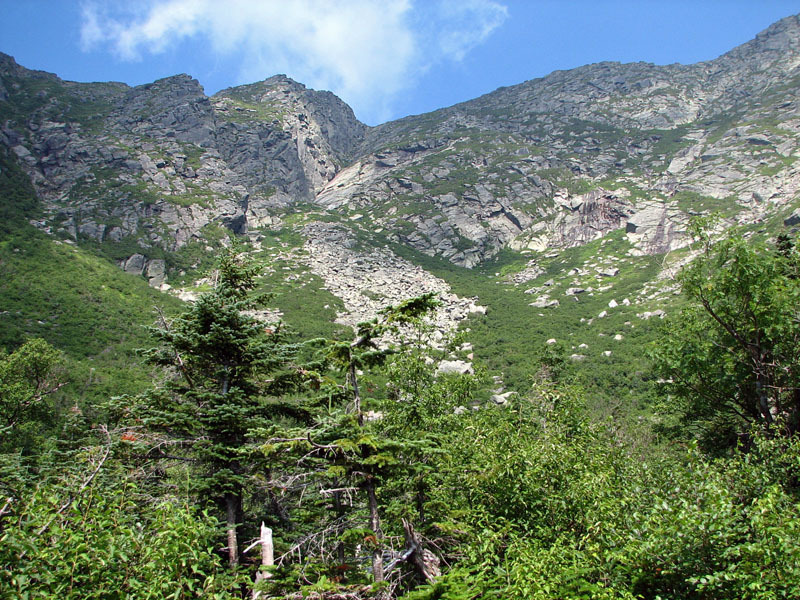 Around 8:00, I started up the Tuckerman Ravine Trail. 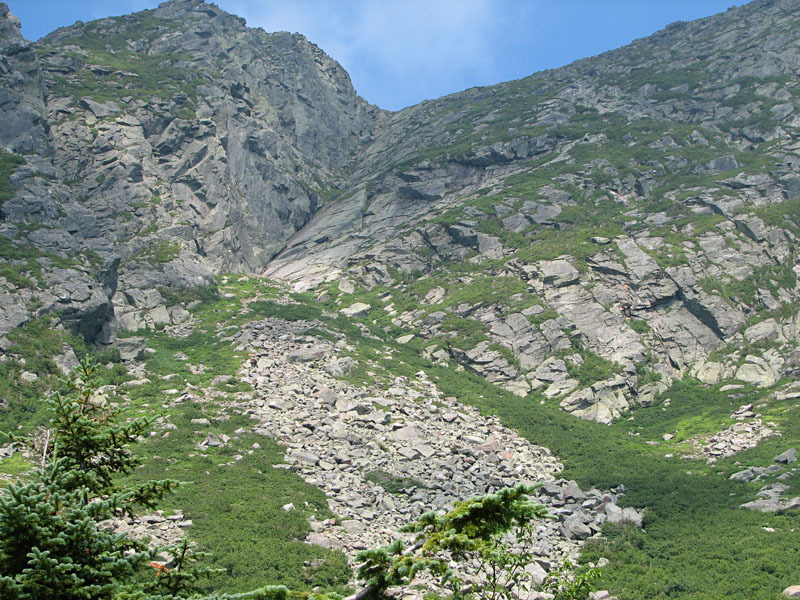 It was déjà vu all over again, as I had been there less than a month before when I took the Tuckerman Ravine Trail to Mt Washington. The lower part of the trail, from Pinkham Notch to Hermit Lake, is extra wide to accommodate snow tractors, which are used by snow rangers and for rescue operations. 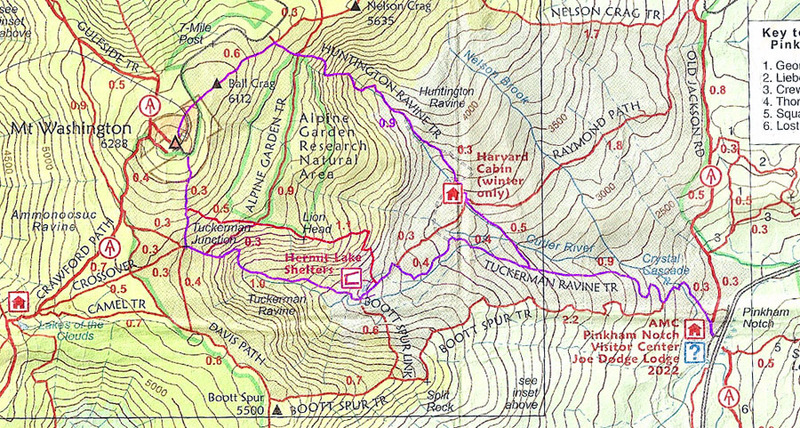 About halfway to Hermit Lakes, the Huntington Ravine Trail branched off to the northwest. The moment I left the wide expanse of the Tuckerman Ravine Trail, I was in a different world. The trail at this point was rocky, root-filled, narrow, and twisty, with many minor ups and downs. My pace immediately slowed down, and I started to worry about how long it would take to get to the top at this rate. Luckily, soon after crossing the Cutler River, the path became a bit less rough and I was able to climb a little faster. 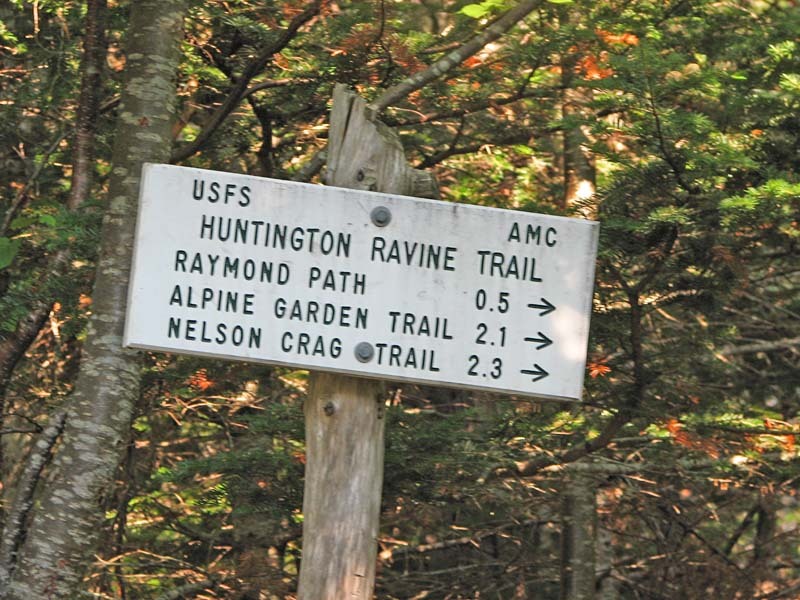 A quarter of a mile or so beyond the Cutler River, the Huntington Ravine Trail intersects the Huntington Ravine Fire Road for the first of several times. A bit of a misnomer, the Fire Road is similar to the Tuckerman Ravine Trail, a wide snow tractor road in the winter. In the summer, it is not even close to passable in any kind of vehicle, and in fact, is actually somewhat rougher and rockier than the Huntington Ravine Trail. I took a slight round-trip detour down the Fire Road to where I knew I would find the Harvard Cabin. 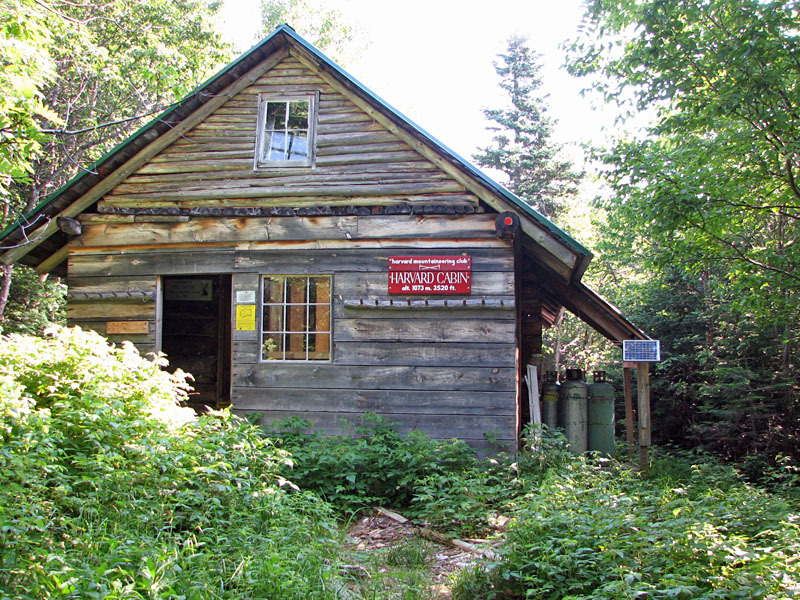 Open only in the winter, the Harvard Mountaineering Club maintains this cabin, which is a popular overnight stop for ice climbers. Continuing, I detoured once more onto the Fire Road and returned to the trail at the next intersection, soon reaching the Albert Dow first aid cache. The cache is named after a local search and rescue member who was killed in an avalanche in 1982 while searching for missing climbers (who made it out safely). Not far past the cache, I caught my first glimpse of the ravine itself. Dominated by the large Central Gully and the spreading talus field below it known as the Fan, the ravine has numerous gullies and buttresses that rock and ice climbers seek out. My path, however would avoid the gullies and follow the right edge of the Fan up to Central Gully, and then turn right to ascend the slabs. Moving out onto the floor of the ravine, the trail followed a winding path around, over, and even under huge boulders at the bottom of the Fan. Crystal Cascade. 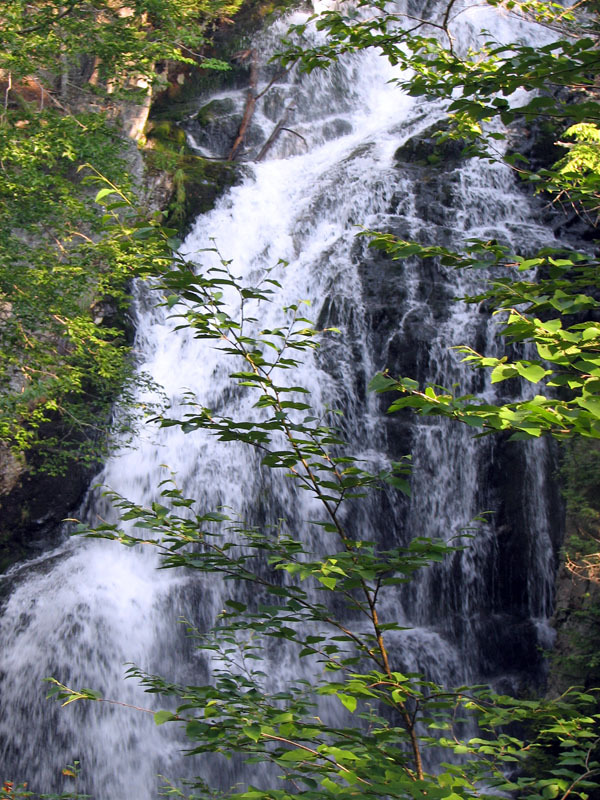 These falls in the Cutler River are just a short hike from the Visitor Center. Huntington Ravine Trail sign. 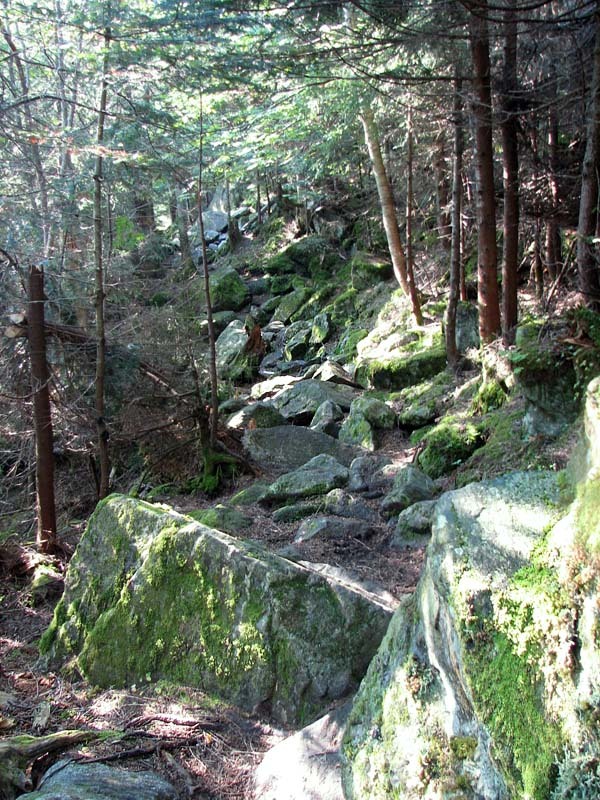 This trail branches off from the Tuckerman Ravine Trail about halfway up to Hermit Lake. Huntington Ravine Trail. The moment you leave the wide expanse of the Tuckerman Ravine Trail, you're in a different world. The trail at this point is rocky, root-filled, narrow, and twisty, with many minor ups and downs. Harvard Cabin. Open only in the winter, the Harvard Mountaineering Club maintains this cabin, but it is open to all. It's a popular overnight stop for ice climbers. 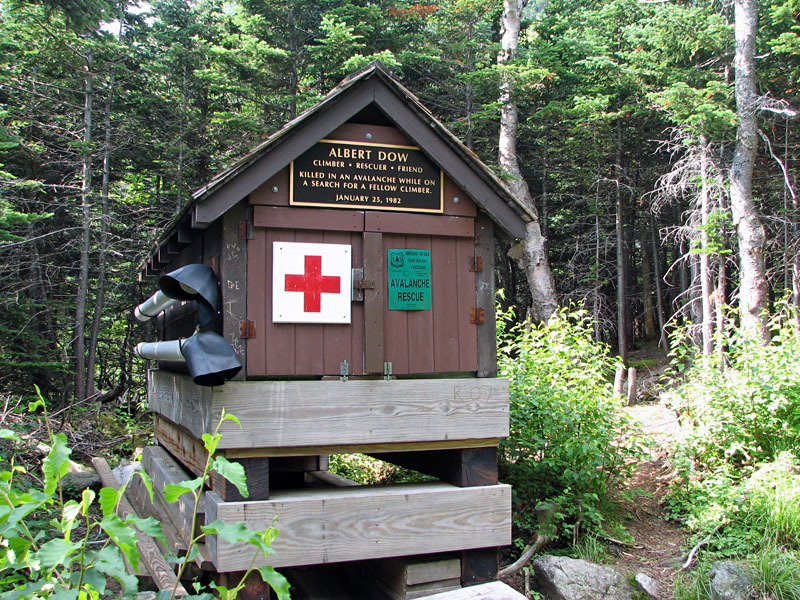 Albert Dow first aid cache, This emergency supply cache was named after a local search and rescue member who was killed in an avalanche in 1982 while searching for missing climbers. Huntington Ravine. Dominated by the large Central Gully (diagonal rift at center top) and the talus field below it known as the Fan, the ravine has numerous gullies and buttresses that rock and ice climbers seek out. Closeup of Central Gully and the Fan. The Huntington Ravine Trail follows the right edge of the fan up into Central Gully, then turns right to ascend the slabs. Tunnel in trail. 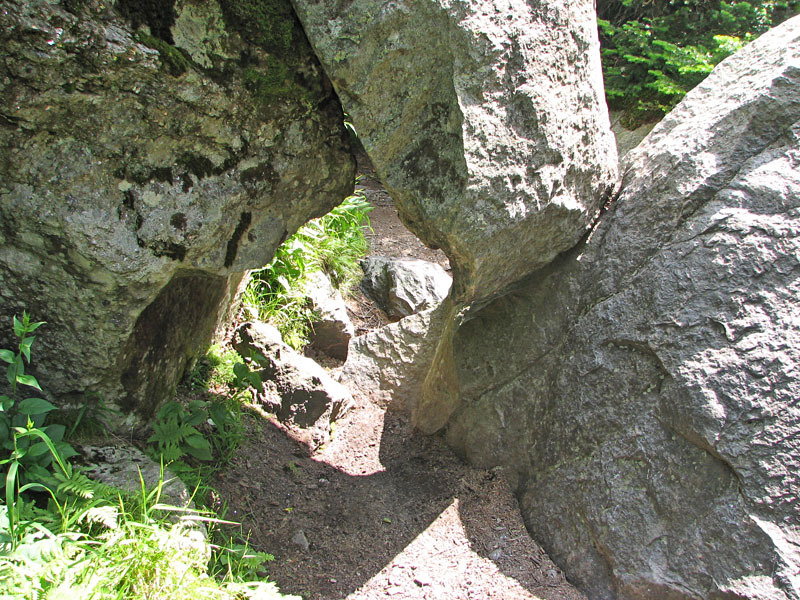 The trail goes right through this natural gap in the boulders near the bottom of the Fan.